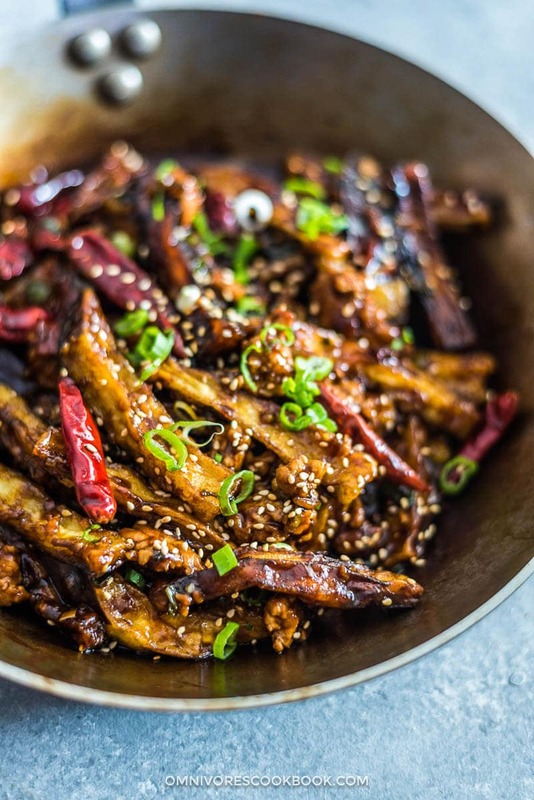 Sichuan eggplant stir fry, or yú xiāng eggplant (鱼香茄子), is one of those under-appreciated real-deal Sichuan dishes that deserves more attention. Throughout the years, whenever I took a foreign friend or colleague to a Sichuan restaurant in Beijing, this stir fry was always one of the most popular dishes on the table. Nobody would order this dish on a menu if they saw the direct translation… yú xiāng literally translates as “fish-fragrant” in Chinese, which might not sound as appetizing as the dish tastes. In fact, fish-fragrant eggplant has nothing to do with fish. According to folklore, a housewife was cooking eggplant for dinner and did not want to waste the leftover sauce used in a fish dish. The sauce was designed to cover up the fishiness and muddiness of river fish, so it’s extra fragrant. The dish turned out so well and her husband loved it more than the original fish dish. Thus, the dish was named yú xiāng or “fish-fragrant” as a homage to the delicious sauce. Yú xiāng flavor is one of the seven key flavors in Sichuan cuisine. It contains soy sauce, Chinkiang vinegar, sugar, fermented spicy bean paste (dòubànjiàng), chili peppers, and a great amount of fresh garlic, ginger and onion. It results in a well-balanced, sweet and sour spicy sauce that is bursting with umami. The taste might be considered close to General Tso’s sauce, only 10 times more flavorful. Eggplant is one of the most tricky vegetables to cook with, however the result is super rewarding if you do it right. In the past, I’ve discovered the method of creating crispy eggplant on the stovetop without deep-frying. The key is marinating the eggplant with salted water and then dusting it with cornstarch before grilling it on a flat-bottom pan. You can read my Chinese Eggplant with Garlic Sauce recipe to view the details. 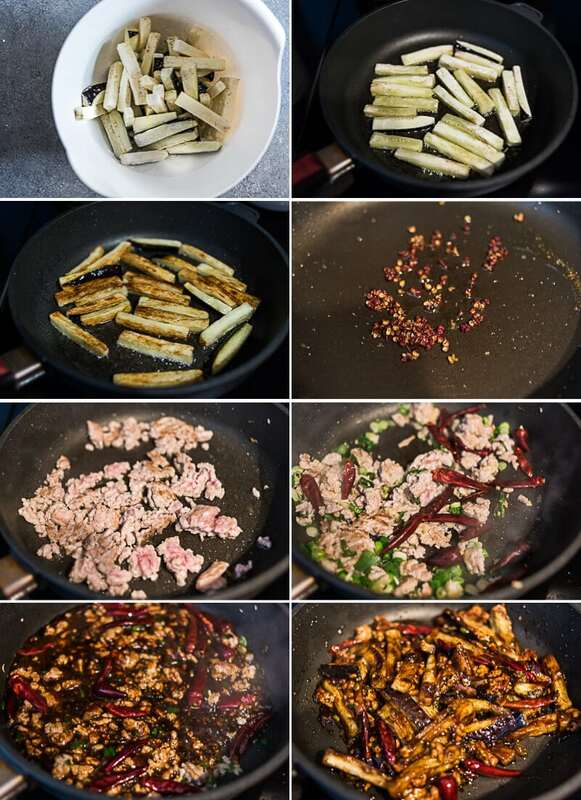 When cooking the yú xiāng eggplant the result is even better. The old method stays the same — the only thing I did slightly differently is use a bit more oil, about 1/2 cup. It is double than in my previous recipe, but still way less than for deep-frying. 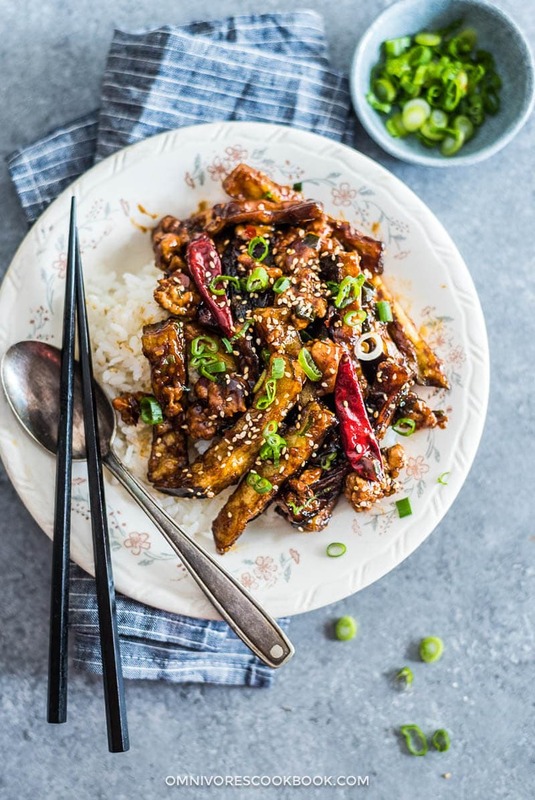 Not only do the eggplant pieces turn out extra crunchy crispy with a tender interior, they stay crispy for a long time even after coating with the sauce. Better still, this time I used regular eggplant instead of Asian eggplant, and it worked! 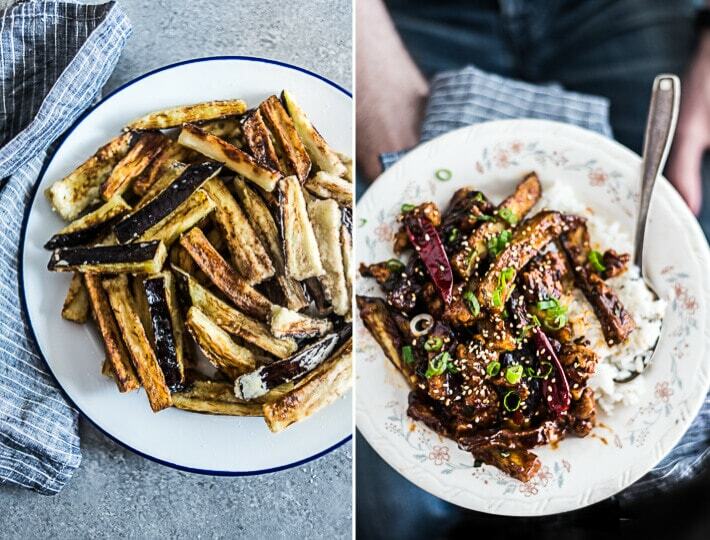 It proved again that you can cook perfect crispy eggplant if you follow the right method. Next time you don’t need to make the extra trip to the Asian market to make this hearty dish. Worried that your dish will be loaded with calories due to the added oil? It won’t; the eggplant only absorbs a small amount of oil during cooking. Still don’t want to use so much oil? No problem. You can reduce the oil to 2 to 4 tablespoons and still get sticky eggplant with quite a crisp surface. I’ve created this short video for you, so you can easily get an idea of the workflow. The video is slightly different from the recipe below because I updated the recipe with a few small tweaks… but the cooking process is the same. Chop eggplant into long sticks of about 2-inch (5-cm) long and 1/4-inch (6-mm) thick. Place eggplant in a large bowl and add water to cover. Add 1 teaspoon salt, mix well. Place a pot lid on top to keep the eggplant under water for 15 minutes. Drain and pat dry. Add all the sauce ingredients into a bowl. Stir to mix well. Sprinkle eggplant with cornstarch and mix by hand, until eggplant is evenly coated with with a thin layer of cornstarch. Add oil to a large nonstick skillet and heat over medium high heat until hot. Spread eggplant across the bottom of the skillet without overlapping (you might need to cook in 2 or 3 batches). Fry the eggplant one side at a time until all the surfaces are charred and the eggplant turns soft, 5 to 7 minutes. Transfer to a plate. Cook the remaining batch(es) with the same method. If the skillet gets too hot and starts to smoke, turn to medium heat. Once the eggplant is all cooked, remove the pan from the stove. Drain extra oil and only leave 1 tablespoon in the pan by pouring the oil into a heatproof bowl, or wipe the pan with a few layers of paper towels attached to the front end of a pair of tongs. Add the Sichuan peppercorns into the pan. Cook over medium heat until the peppercorns turn dark brown. Remove them with a spatula and transfer to a small bowl (*Footnote 3). Add the pork. 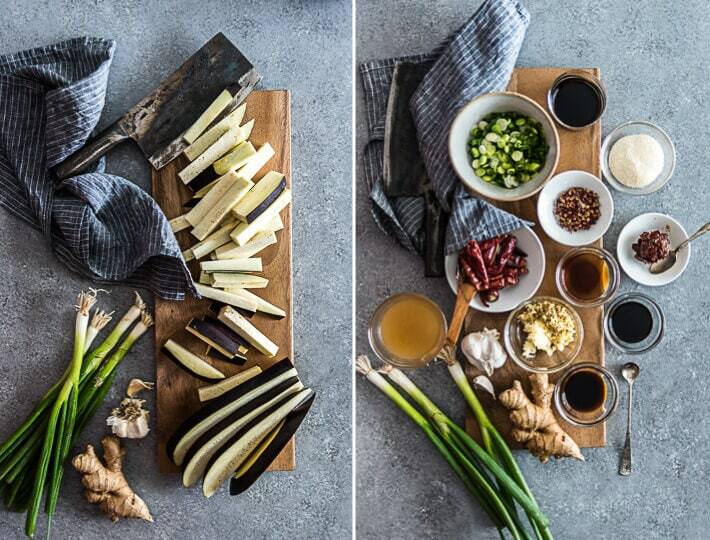 Cook and chop with your spatula, until separated into small bits and cooked through. Add green onion, garlic, ginger, and dried chili peppers. Stir a few times to release the fragrance. Stir the sauce again to completely dissolve the cornstarch, then pour into the pan. Stir until the sauce thickens. Return the eggplant to the pan and quickly stir to mix everything well. Turn to the lowest heat and taste the sauce (be careful, it will be very hot!) Adjust flavor by sprinkling a bit more salt or sugar, if needed. Turn to medium heat and mix well again. Transfer everything to a plate immediately. Serve hot over steamed rice as a main. You can either use long Asian eggplant or regular eggplant. If you follow the steps in this recipe, both eggplants will turn out perfectly crispy. You can skip the pork to make a vegan dish and the sauce will still be very tasty. The cooked Sichuan peppercorns become fragrant with a more rounded taste, so they make a great seasoning. Save the fried Sichuan peppercorns and grind them into powder. Store in an airtight container in the fridge for 1 month and use it in recipes that call for ground Sichuan peppercorns. This recipe was originally published on March 4th 2014, updated on April 11 2017. Beautiful photo! I learned how to make this dish during a cooking class in Dali China and loved it! I loved watching your video! Eggplant is my favorite veggies and this sounds really delicious. I always wish that they don’t absorb much oil while cooking. That’s one negative thing about this veggie, but I love that it absorb sauce… haha. Looks delicious!!! I totally agree with you about eggplant absorbs too much oil! They don’t taste so great if cooking with less oil and I already tried my best to reduce the oil to minimum amount. 1. Spread the sliced eggplant on a towel. 2. Sprinkle Kosher salt on both surfaces of the sliced eggplant. 3. Allow to rest for 45-60 minutes. 4. Pat dry each surface. 5. Do not rinse eggplants. This method will extract the moisture from the eggplants and will allow very little amount of oil to be absorbed. Most oil will be on the outside. Wow, your entire blog looks fantastic and makes me so hungry! I”m gonna have to start making a whole bunch of your recipes! This recipe is a winner! I made it today and it was a universal success. What a great idea to soak the eggplant strips in water! That looks fantastic……such vibrant colours. I, like many, didn’t like eggplant as a kid however love it now. One of my favourites is vegetarian lasagne made with eggplant. I’ll need to give this a try Maggie, thanks for sharing. Hi Trent, thanks for stopping by and commenting! The fish fragrant sauce contains no fish at all!? Nope, no fish in this one. “Fish fragrant” is a special combination of condiments that commonly used in Szechuan cuisine. It is said the sauce was originally used for cooking fish, but when people tried the sauce with other dishes, they found they are all very tasty, for example fish fragrant pork. I think it’s similar to sweet sour sauce, goes well with everything. But this one has “fish” in the name, so sounds confusing. great technique. thanks for sharing! This looks really good, I will try this next week. I’ve been steaming my eggplants before stir frying them. That really cuts down on the oil. I add salt and fish sauce while steaming the eggplants too. Hi Samantha, thanks for sharing the tips! I like fish sauce and it sounds lovely with the eggplant. I steam eggplant too, but only used it in cold dishes. I like the crispiness of eggplant in stir fried dishes, but it does use more oil. Ultimate dilemma! I don’t have the Chinkiang vinegar or the rice wine, can I just use malt vinegar and leave out the wine? 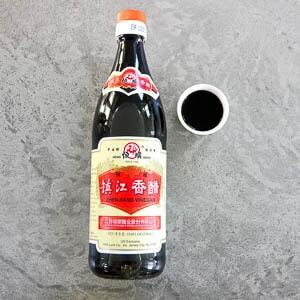 If you don’t have Chinkiang vinegar, you can use Balsamic vinegar. So glad I found your website. Looks like my search is over! This is going to be my one-stop go to for Chinese recipes! 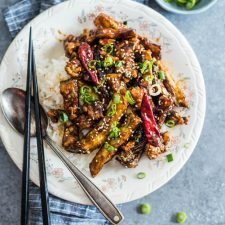 I have been trying to find authentic chinese eggplant recipes and have tried so many not-so-good ones. I’m from Shanghai and I appreciate all food and I cook Italian and American on most days. But the fusion recipes on traditional dishes just don’t cut it for me. I tried this one tonight and love it! Thank you for sharing! Mapo Tofu is next. Please let me know if you want to learn a new recipe but couldn’t find on my blog! I’d love to develop the recipe for you! I’d love to see a recipe for soup dumplings!! Thanks so much for this! I have not been this moved by a blog post for quite some time! You have got it, whatever that means in blogging. Anyway, You are definitely someone that has something to say that people need to hear. Keep up the wonderful work. Keep on inspiring the people! i will give it a try tonight for I am planning to prepare healthy and yummy eggplant dish for my hubby. as eggplant is pone of our fave veggie, i am so bored with the same method i cook that is why I am searching different way of cooking eggplant and i came across to this. Thanks to this ms maggie, more power. 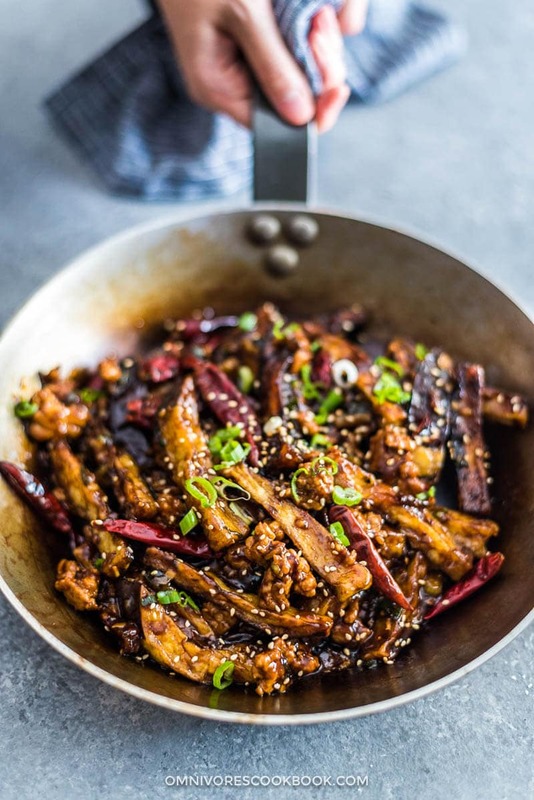 If you need another eggplant dish, try out this one too: https://omnivorescookbook.com/chinese-eggplant-with-garlic-sauce It’s one of the most popular recipes on my blog. Let me know how the cooking goes! I finally had a chance to stop-by the nearest Asian grocery store (that’s two hours away) and got Chinese eggplant to make this. The eggplant came out really nicely. My husband mentioned the crispiness without me pointing it out (although, he thought it was mushroom). Thank you for the recipe. I forgot! I couldn’t get fresh Thai chili. I used dried ones and stir-fried it in oil hoping that the spiciness would transfer. Is there a good way to substitute with dry chili or red pepper flakes? I’m glad to hear you and your husband enjoy the dish! To answer your question, yes, dried chili peppers and red pepper flakes definitely work. In fact it’s the more proper way to do it, in an authentic Sichuan way. I happened to have Thai chili on hand that time so I ended up using it. To make the sauce spicy, you can either snip the dried chili peppers to 2 to 3 pieces (to reveal the seeds) or add about 1 teaspoon chili flakes (depends on the spiciness of your chili flakes). This dish looks delicious! I’ll have to make it when eggplants come into season this summer. But I’m really curious about the key flavors of Sichuan cuisine. What are the other six? I assume one is mala? Thank you! I love learning about the different cuisines of China through the delicious recipes on your blog! I LUUUUUV eggplant! This has to taste like a rock band in your mouth. Definitely will be trying this. Thank you. Yes definitely! Happy cooking Amy and let me know how the dish turns out 🙂 This is one of my favorites and I hope you enjoy it too! Tes recettes sont formidables….non seulement tu nous régales mais en plus tu nous instruits à travers la genèse de la recette.Le choix est vaste et satisfait même les plus difficiles ! Tu côtoies l’excellence et tu enrichi notre culture culinaire…merci pour ton partage et continue de nous émerveiller ! ??? Merci pour tes recettes aussi délicieuses les unes que les autres ! Non seulement tu régales nos papilles mais en plus tu enrichis notre culture culinaire à travers la genèse de chaque recette ! Bravo et continue de nous émerveiller ! ?? Hi, I’ve been enjoying this recipe as one of my ‘go-to’ quick dinners for a while, but just recently noticed you have changed it (inclusion of stock, use of szechuan peppercorns etc). We found the new version was not as nice as the original . Can you you send me the original version? 1. Add eggplant and 1 teaspoon salt into a large pot of water and mix well. Place a lid on top of the eggplant to keep it submerged in the water. After 10 to 15 minutes, drain the eggplant and dry it thoroughly with a paper towel. Sprinkle 2 teaspoons cornstarch over the eggplant, 1 teaspoon at a time, and rub it by hand to coat all eggplant strips well. 2. Combine light soy sauce, vinegar, Shaoxing wine, 1/4 teaspoon salt, sugar and 1 teaspoon cornstarch in a small bowl, mix well, and set aside. 3. Heat 2 tablespoons of oil in a big nonstick skillet over medium high heat. 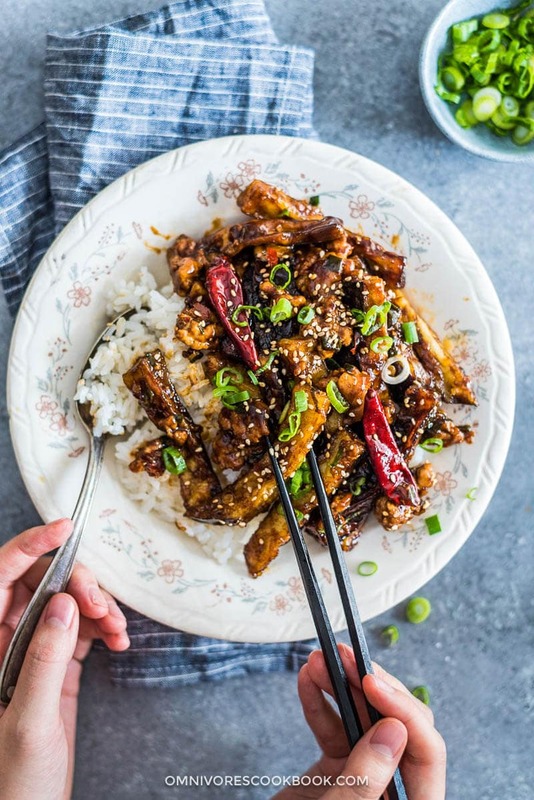 When oil is hot, after about 2 minutes, carefully add eggplant and stir fry until the eggplant turns soft and golden brown on the outside (* see footnote 1), 5 to 6 minutes. Transfer eggplant to a plate and set aside. 4. In the same skillet, add 1 teaspoon oil, garlic and ginger, and give it a stir. Add ground pork and stir fry until surface of pork turns white, about 1 minute. Add Doubanjiang and continue stirring constantly until pork mixes with the paste and turns dark red, about 1 minute. Add Thai pepper and eggplant and give it a stir. Evenly pour the mixed fish fragrant sauce (from step 2) over the eggplant and stir immediately to mix everything well, for 1 – 2 minutes. (optional) Turn to lowest heat and taste the eggplant (be careful, the eggplant will be very hot!). Adjust flavor by sprinkling a bit more salt or sugar, then turn to medium heat and use a spatula to mix everything well again (*see footnote 2). Stop heat and transfer eggplant with the pork and sauce to a plate. 5. Serve warm with steamed white rice. I have been making this dish for years…ever since I first saw it on your website! It is one of my favorite dishes and has become a weekly regular. Thank you so much! Hi Jacqueline, thanks for much for leaving a comment and I’m glad to hear you like the dish as much as I do! Top it on hot rice, so irresistible! I made this eggplant dish tonight. First of all, I love, love, love eggplant, especially Thai, Chinese, or Italian. The recipe posted here was absolutely delicious! The one thing I changed up was adding more peppers. We love the heat. Thank you for this recipe. YUM! I could’ve used low sodium soy sauce, but it’s super delicious and I appreciate how you don’t skimp the the sauce. So many similar recipes don’t make nearly enough sauce. Also, thank you for instructing how to infuse the oil with the peppercorns….way more enjoyable than leaving them in. Will be using your site from now on! I’m so glad to hear you tried and like the recipe, Emmie! It’s one of my favorite eggplant dishes 🙂 Looking forward to hearing more dishes you will cook in your own kitchen! My partner and I are not really fans of eggplant, but this recipe looked so good we gave it a try anyway. Oh my gosh, it was SO GOOD! Even just the fried eggplant bare was yummy, but the sauce made them even better! I love the level of heat with doubanjang and the mala of the peppercorn infused oil. Delicious! Thanks so much for taking time to leave a comment and hope you have a great weekend! Thanks for the wonderful recipe! I’ve just tried this tonight. The sauce is absolutely delectable! Sticky sauce is perfect for the rice. However, it’s a tad bitter. What do you think what might have gone wrong? Too much ginger? Or have I let the peppercorn in the pan for too long? Hi KK, I’m glad to hear you tried my recipe! Regard your question about the light bitter taste, it might be caused by Sichuan peppercorns. Adding ginger won’t cause any bitter flavor. The pan can be quite hot after you cooked the eggplant, so the hot oil might over cooked the Sichuan peppercorns. Next time you could try waiting until they turn darker, but not black. we LOVE eggplant and had this dish in a good, family run hole in the wall sichuan restaurant while on the road this summer. i swore i’d make it if i could find a recipe with the abundance of asian eggplant from ou garden. made it tonight using home grown hot and sweet peppers and also added browned tofu chunks (doubled the sauce to accommodate and it was the perfect amount). thank you for a great recipe i am totally bookmarking this one to make again! I tried this last night and it was delicious! I’ll be making it again! Can’t wait to try this ( vegan )I am a former Austinite now living in Hangzhou.Had this in Chengdu at a neighborhood shop on a cold rainy day and it warmed me up!!! Inside out..I have been craving it ever since.Thanks for the recipe will let you know how it turns out! Hello. We made this last night and it was SO good! We have never found a recipe for eggplant that we really enjoyed. Now we have. And you’re right–the eggplant did stay crispy, even when we added the sauce. Such a delicious combination of flavors. Thanks for sharing this great recipe! Hi Maggie. We have used 2 of your recipes this week. Sichuan Dry Fried Beans with pork is in regular rotation at our house, so that was one. The other was this Sichuan Eggplant Stir Fry. I was inspired to try it because we had an amazing Szechuan Eggplant with Fish dish at a restaurant (actually a counter at a food court) near Atlanta; trust me, it’s worth it! I didn’t find a specific recipe for that, but this dish comes close (without the fish). We used the long thin eggplants which did not stay crispy in the sauce but the texture and flavour were still lovely. We had it over riced cauliflower. Thank you for all your hard work! There is nothing in the instructions about cooking the optional pork. Oops! Sorry about that. I just added the instruction to step 7. Thank you. I feel better about trying the recipe. This is amazing. It literally melts in your mouth. It’s in my rotation. My family loves it. Thank you for this gem! Hi I made way too much egg plant. Can I freeze this, after cooking it? This is how I discovered the website, searching for Sichuan eggplant! It was so delicious and the instructions were so clear and easy to follow. This dish melts in your mouth. Thanks Maggie! Wow, what a great recipe. We live in a small town so the spicy bean paste isn’t in any of our grocery stores, but we found a bean sauce that has been paste as a main ingredient, so we used that and let the moisture cook off. We’re vegetarians so we’re always on the lookout for new recipes to have in our repertoire. Thanks. Excellent. That was the tastiest Chinese dish I’ve ever made! Thank you so much! I can’t wait to try your other recipes now. This dish was phenomenally delicious. The sauce was to die for. Ideal balance of sweet, sour and hot. Thank you Maggie! !